How do we sustain hope in the face of a seemingly hopeless situation? For me hope is rooted in faith, especially in my understanding of Christ. It’s not a political or strategic calculation. Coming at the question of hope and the struggle for freedom from a Buddhist tradition, the Dalai Lama also challenges activists to go deeper. The heart of a peacemaker needs to be spiritually rooted for the hardest and longest struggles. The Dalai Lama at the Vancouver Peace Summit in 2009. Tenzin Gyatso was born in a rural village in Tibet. Following the practices of Tibetan Buddhism he was recognized as the 14th reincarnation of the Dalai Lama, a term that means Ocean of Wisdom. Dalai Lamas are believed to be the manifestation of the Bodhisattva or enlightened being of compassion and the patron saint of Tibet. As the Dalai Lama, Tenzin Gyatso began his monastic education at the age of 6. He received his doctorate in Buddhist philosophy at 23, but prior to completing his education, politics intervened to shape his life in a dramatic fashion. In October, 1950, China invaded Tibet and seized control. During the next month the Dalai Lama assumed full political power in the Tibetan government where the Dalai Lama has traditionally been the absolute ruler. He initially sought to work within the Chinese Communist system, meeting with Mao Tse-Tung, Chou En-Lai, and other Communist leaders. Then, in 1959, there was a failed uprising by Tibetans that prompted the Dalai Lama to flee to Dharamsala, India, and set up a government in exile. Tens of thousands of Tibetans followed him into exile, leaving Tibet for India and other parts of the world. In articulating his three major commitments, the Dalai Lama sees himself first as a promoter of human values such as compassion, forgiveness, tolerance, contentment, and self-discipline. He says, Love and compassion are necessities, not luxuries. Without them humanity cannot survive. A central Buddhist ethical teaching is to do no harm. The Dalai Lama teaches, It is necessary to help others, not only in our prayers, but in our daily lives. If we find we cannot help others, the least we can do is to desist from harming them. Through his teaching the Dalai Lama addresses both the internal aspects of personal peace and the social and political dimensions of peace. Both are necessary. He said, We can never obtain peace in the outer world until we make peace with ourselves. On the other hand he said, It is not possible to find peace in the soul without security and harmony between the people. As a religious peacemaker he teaches and works for the inner and outer forms of peace. 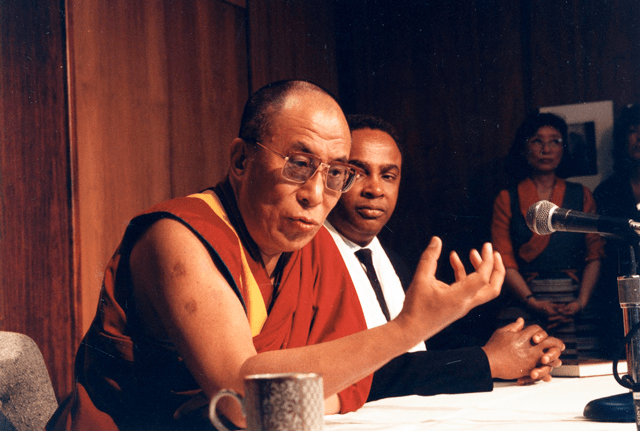 Tenzin Gyatso and Seattle Mayor Norm Rice in 1993. The Dalai Lama’s second commitment is to harmony and understanding among the world’s religious traditions—a specific area of global peacemaking to which he has given much effort. He sees the exchange of ideas and feelings between leaders of different religions as a way to open the door to a progressive pacification between people. He has met with almost every major religious figure in the world in his quest for understanding and harmony. He is more than the formal head of a major religious group appearing in global religious congresses. He has participated directly in the organizing and planning of such events. This document is an attempt to set forth a vision of nonviolence within the context of an emerging global civilization in which all forms of violence, especially war, are totally unacceptable as means to settle disputes between and among nations, groups and persons. This new vision of civilization is global in scope, universal in culture and based on love and compassion, the highest moral and spiritual principles of the various historical religions. Its universal nature acknowledges the essential fact of modern life: the interdependence of nations, economies, cultures and religious traditions. His third commitment is to the people of Tibet as their Dalai Lama. While in exile the Dalai Lama began a thorough overhaul of the Tibetan political system. He abandoned Tibet’s traditional heavy-handed feudalistic system and established democratic reforms in both the government-in-exile and in the plans for a constitution for a free Tibet. He designed a process upon return to Tibet to have the Dalai Lama step down from his traditional position of political power and become an ordinary citizen, sharing in life under a fully democratic government. He has also set up many educational, cultural and religious institutions to preserve Tibetan identity and culture during the period of exile and Tibetan Diaspora. The Dalai Lama has persistently sought nonviolent means for liberating Tibet. He has repeatedly taken the case of Tibet to the United Nations, resulting in the passage of a number of General Assembly resolutions in support of Tibet. In 1987 he proposed a Five-Point Peace Plan to deal with Tibet. He proposed making Tibet a zone of peace, halting the massive influx of ethnic Chinese into Tibet, halting nuclear weapon production and nuclear waste dumping in Tibet, and negotiating constructive relationships between China and Tibet. The Dalai Lama’s peacemaking efforts were recognized with a Nobel Peace Prize in 1989, but they were not received positively by China. The Dalai Lama tried to accommodate China’s interests, but he held that whatever the outcome of the negotiations with the Chinese may be, the Tibetan people themselves must be the ultimate deciding authority. In 2008, during the lead-up to the Beijing Olympics, another uprising and violent repression in Tibet focused world attention on the situation in that mountainous region. During this crisis, new contacts were made between the Dalai Lama and the Chinese government to open negotiations on the status of Tibet. Once again Tibetan hopes and dreams were shattered when the talks failed to achieve any political change. Rajesh Kasturirangan and Dalai Lama at Mind and Life conference. Today the world is smaller and more interdependent. One nation’s problems can no longer be solved by itself completely. Thus, without a sense of universal responsibility, our very survival becomes threatened. Basically, universal responsibility is feeling for other people’s suffering just as we feel our own. It is the realization that even our enemy is entirely motivated by the quest for happiness. We must recognize that all beings want the same thing that we want. This is the way to achieve a true understanding, unfettered by artificial consideration. The light of his vision has attracted not just Tibetans or Buddhists, but people of many faiths and many nationalities.